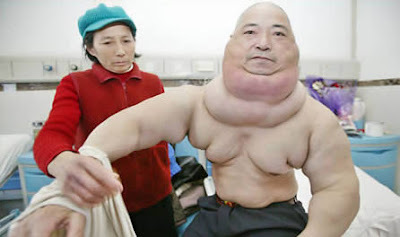 On 2008, a Chinese man named Huang Chuncai underwent surgery to remove a 20kg or 44 pound tumor on his face. The surgery was successful but due to the large size of the tumor, only a part of it was removed at that time. Just a few days ago, Huang Chuncai went into the operating room again to remove another part of that facial tumor. This time, it was a large 4.5kg (9.9lb) chunk of flesh from his face. The tumor was originally 23kg in total. 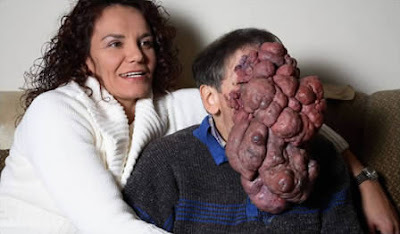 This still leaves 17.5kg of facial tissue from this tumor on his face (1kg was removed in the first surgery and 4.5kg was removed in the second surgery). Huang Chuncai suffers from Neurofibromatosis, a rare genetic disorder that causes growth on nerve tissues. 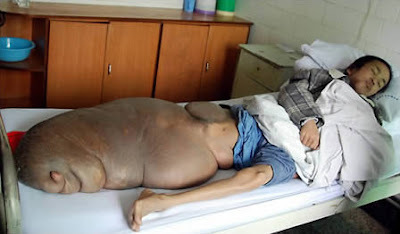 This man from China finally had a huge tumour removed on 2007, after discovering it 17 years ago. Huang Liqian, 58, first discovered a bizarre growth on the back of his neck in 1990, but chose to ignore it. However, as the years rolled on, it continued to increase in size at a rapid pace, with the growth ballooning to 15kg. Liqian was taken to the First Affiliated Hospital of Chongging University of Medical Services in southwest China's Chongging, where he had the tumour removed. Victim Chen Zongtao, 29, lives in a remote Chinese village and hasn't been able to afford medical help. The growth first started on his left foot when he was two years old. But it soon spread across to his right leg and engulfed it. Over the years, it has ballooned in size to weigh more than 70KG or 154 pounds. Doctors at the hospital in Changsha, central China's Hunan province, have been probing the tumor. 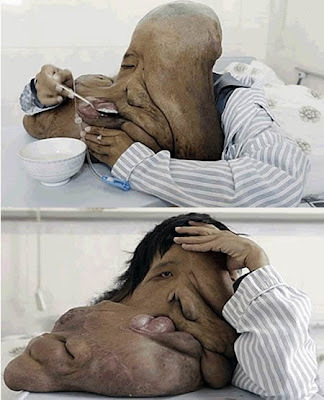 Zongtao is said to be suffering from neurofibroma - a usually-benign tumour originating in nerves. It is not yet clear if medical teams plan to take action on the growth. Gao An-ni, an 8-year-old girl from the rural countryside in An Yuan county in East China's Jiangxi Province, suffers from a tumor in her underlip. An-ni was born with a tumor in her underlip, and she couldn't receive timely treatment for the poverty. On 2007, her father took her to see doctors at the Hospital affiliated with Gannan Medical College. But when doctors there told him that the operation to cure the tumor and the following cosmetic surgery might cost a lot for the family, the father decided to bring back his daughter to their hometown. Vietnam's Lai Ti Dao suffered from a massive Schwannoma tumor, a benign growth that began with a small lump in her tongue but swelled over the years to a size roughly one-third her body weight. The tumor makes it difficult to eat, talk and even walk because its size throws the girl’s small frame off balance. The growth is now dangerously close to cutting off her airway. On 2008, a team of surgeons at the University of Miami had a marathon 10-hour procedure to cut away the growth, which weighted an estimated 10 pounds. 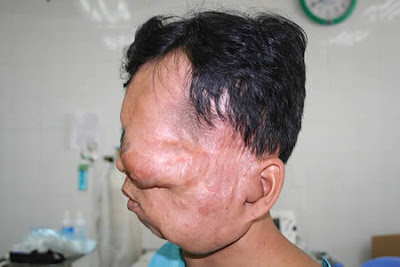 Phuong is a 27-year old who has a facial tumor that began to grow at age 7, and quickly took over his entire left face, enveloping his eye and ear, clearly keeping him from living a normal life. He has had three surgeries before, but the tumor grown back each time. Recently, no local doctors or international team visiting the area has offered to take his case, due to the risk involved with the blood loss and the need for careful post-op care. This case would be considered a difficult case and booked for a full day in the OR. 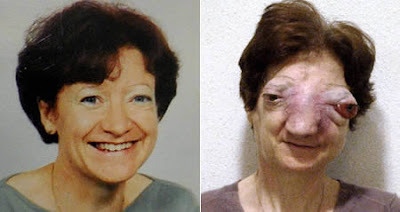 A retired French teacher, Chantal Sébire suffered from esthesioneuroblastoma, a rare form of cancer, and fought for the right to die through euthanasia. In 2000, she was diagnosed with esthesioneuroblastoma, a rare form of cancer of which only 200 cases have been reported in the past 20 years. Sébire refused any treatment at the time of her diagnosis, not wishing to take the risk of the surgery or medications. On March 19, 2008, she was found dead in her home. An autopsy conducted on March 21, 2008 concluded that she did not die of natural causes. Subsequent blood tests revealed a toxic concentration of the drug Pentobarbital, a barbiturate that is not available in French pharmacies but is used elsewhere in the world for the purpose of physician assisted suicide.